You save £9.00 that's 36% off! This bulb is ideal for lighting rooms, hallways, porches, where it is important to automatically have some light when it becomes dark without the need to physically switch on. The product can also be used outside if it is enclosed in a suitable fitting to protect it from the elements. The product can be used for security purposes where you would like a light to come on when you are not at home or for safety reasons where an area could become a hazard without any lighting. 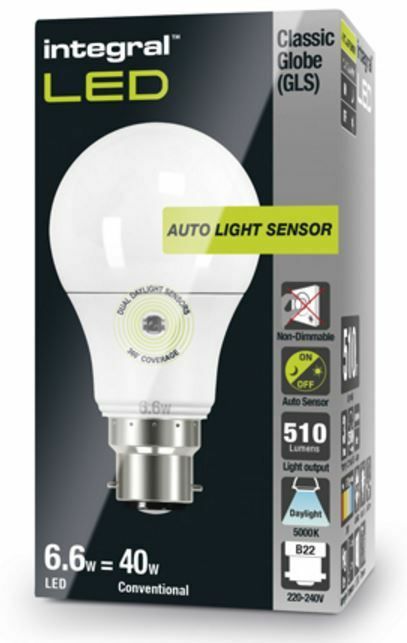 The product is a similar size to a traditional light bulb and delivers a cool white light at 5000k (On the box this colour is referred to as Daylight) courtesy of the SAMSUNG LED chip. A Cool White LED lamp will provide a modern, clean, bright light, that is slightly blue in colour. The cool white colour temperature covers the range between 4000-6000K). It terms of brightness the bulb produces 510 lumens which is a suitable replacement for a 40W halogen bulb and due to the large 270 degree beam angle in some cases the product would be sufficient for a 60W incandescent replacement. By only consuming 6.6 Watts this product is much more energy efficient than traditional incandescent lamps and will automatically turn off in the day time for increased energy savings. In comparison to using timer switches this bulb will come on based on the low light level so there is no need for adjustments when the clocks go back or forwards. The bulbs uses the bayonet or B22 fitting so will fit into a standard bayonet socket without the addition of any other products. The manufacturer state that security lighting is on an average of 12 hrs. per day it is possible to save over £20 per bulb, per year on energy. It automatically switches ON at dusk and OFF at dawn, with dual 360 sensors to detect daylight from all angles. Ideal for external porches, walkways, paths and patios. To be used in suitable enclosed outdoor fittings. The dusk to dawn light is also available in an warm white and e27 fitting and as a plugin option.